Will India be able to finish the series with 5-1? The host will be thinking of finishing the series on winning note. So Let’s analyze Today Dream11 Fantasy Cricket Prediction Of IND Vs SA 6th ODI and try to find out who will win the match? Our analysis will be purely based on playing condition, pitch report, likely 11 and other important statistics, data and a bit of astrology, so that nothing is left behind. We will also provide tips and tricks for dream11 and toss prediction so that your winning chances increase to 100%. Who Will Win the 6th ODI, Ind v RSA? 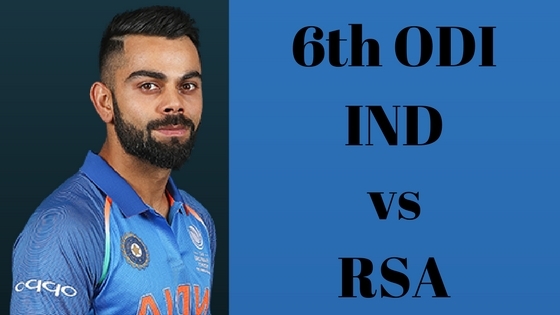 Match: India Tour of South Africa, 2017-18, SA v IND, 6th ODI. Time: 11:00 am GMT, 04:30 pm IST. Average first inning score is 246. Average second inning score is 211. Highest total on this ground was 392/6 in 50 overs by SA v PAK. Lowest total on this ground was 118/10 in 32.2 overs by SA v IND. SuperSports Park generally supports the seamers, there is an opportunity for the batsman also as the ball comes to the bat. It is also predicted that the pitch will not support the spinners, the ball will skid in this ground but it is also true that RSA has no answer to the spinning twin. If we look at the last match played here in this series, the spinning duo has made it difficult for the Proteas to score runs. They together took 8 wickets and the fast bowlers took 2 wickets. Proteas could only score 118 runs in 32.2 overs which is the lowest score in this ground. In this ground India team has played 6 matches against South Africa team in which Ind has won 3 games, SA won 2 matches and 1 match had no result. It seems that this ground favors Men In Blue. Moderate or heavy rain is possible in Supersports park, if we see the whole day, morning and afternoon it is predicted to be partly cloudy and at evening and night patchy rain is possible the maximum temperature will be 29-degree Celsius and the minimum temperature will be 21-degree Celsius. It is expected that the game will not be affected. Although the rain might help the seamers initially. So consider taking more seamers on your team. Virat Kohli (c), Rohit Sharma, Jasprit Bumrah, MS Dhoni (wk), Bhuvneshwar Kumar, Shardul Thakur, Shikhar Dhawan, Shreyas Iyer, Yuzvendra Chahal, Ajinkya Rahane, Axar Patel, Manish Pandey, Hardik Pandya, Kedar Jadhav, Mohammed Shami, Kuldeep Yadav, Dinesh Karthik. Aiden Markram (c), AB de Villiers, Tabraiz Shamsi, Farhaan Behardien, Andile Phehlukwayo, Imran Tahir, Jean-Paul Duminy, Heinrich Klaasen (wk), Lungisani Ngidi, Morne Morkel, David Miller, Kagiso Rabada, Khaya Zondo, Hashim Amla, Chris Morris. Kohli would love to end the series by winning the 6th ODI but seeing the workload of Bhuvneshwar Kumar and Jasprit Bumrah they might not play the sixth ODI, Mohammed Shami, and Shardul Thakur may get a chance. Manish Pandey has been practicing a lot during the net session, Virat may consider playing Pandey in place of Iyer. Virat Kohli (c), Rohit Sharma, Jasprit Bumrah/Shardul Thakur, Shikhar Dhawan,MS Dhoni (wk), Yuzvendra Chahal, Hardik Pandya, Kuldeep Yadav, Ajinkya Rahane, Mohammed Shami, Manish Pandey. Proteas may rest some of their main seamers as after India they have a forthcoming series against Australia. In 5th ODI Morris was a forced change because of injury. There is a huge chance that Morris will play the final game. AB de Villiers, Aiden Markram (c), Heinrich Klaasen (wk), Lungi Ngidi, Hashim Amla, Chris Morris, Kagiso Rabada, David Miller, Tabraiz Shamsi, JP Duminy, Andile Phehlukwayo. These are the keys players which you can keep on your team. We have selected them on the basis of data and their past performance. MS Dhoni: Dhoni just need 33 runs to achieve 10,000 after Sachin, Ganguly, and Rahul Dravid. MSD didn’t get the chance to bat in the last match played in this stadium and if India bats 2nd, it seems difficult for him to achieve this in the 6th ODI as he bats very late. In the last match Dhoni has contributed 19 points and in today’s match, only 32.7% of the dream11 users have selected him. Heinrich Klaasen: Klaasen showed his potential in the last two matches. Last match he has scored 39 runs but couldn’t take his team to winning side. He has contributed 38.5 fantasy points in the last match. 66.99% of the people have selected him for the last game. Pro Tips: If you are playing in the small league, try to select Heinrich as he has a number of balls to play. For grand league try to make a combination of both. We are assuming that for bigger leagues you will play with multiple teams. Virat Kohli: Kohli has scored 46 runs in the last game played on this pitch. He scored 36 runs in the last match, it was bad luck for him otherwise he would have converted it. In the second match he contributed with 28 points and in the last match, his contribution was 25 points. 88.35% dream11 users have selected him. Rohit Sharma: Rohit Sharma has not performed in the whole series but in the last match he scored 115 runs in 126 balls. He contributed with 77 points and was selected by 36.94% in the last game. In Friday’s match, 69.39% of the fantasy players have selected him. Shikhar Dhawan: He has been in good form throughout the series. He is the player to bank on. He has scored 23 points in the previous match although he just scored 34 runs in in 23 balls. 76.93% have selected him. AB de Villiers: ABD is a player who cannot be ignored. Everyone knows how destructive player he is. He scored 6 runs in the last game and contributed 5 points. His poor performance in the previous matches can be seen in the selection, only 58.12% of the users have selected him. Hashim Amla: After a long failure, Amla finally performed in the 5th ODI. He scored 71 runs in 92 balls and contributed 42 points although he was selected by 40.75% of the users, in 6th game the case is different, he is selected by 59.68%. Aiden Markram (c): Markram has scored 32 runs in the last ODI and contributed 25 points. He is selected by 46.51% of the users in today’s game. Pro Tip: Make sure to keep Kohli and De Villiers in your team. If you are playing with multiple teams, mix the players and make combinations of teams. Pro tip: For small league keep Duminy in your team and if you going with grand leagues and playing with multiple teams, try to select all the players in the above list with a different combination. We will show you how to make teams but those team will just be examples. Try to make your own team. You can go with our team in small leagues. Pro tip: Keep Chahal and Kuldeep Yadav In your team. Pro Tip: If you are playing with six teams try to make captain and vice-captain with a different combination. As we have already given you the stats of last six games. So according to our expert India will win the match but astrology says something else, according to astrology South Africa will win the match. India will win the toss and they will decide to bowl first as the pitch will support seamers initially. India will win the match by 5 to 6 wickets. Conclusion: In this post of Today Dream11 Fantasy Cricket Prediction Of IND Vs SA 6th ODI, we tried to cover all the aspects. If you have any suggestion you can mention in the comment box and most important you can give your expert opinion too. You can also rate the prediction below. This post is our opinion on the sixth match. If there is any change, we will update before a couple of hours. So bookmark this page so you don’t miss the details. Best prediction website I ever found.Thanks a lot for providing such a detailed post.